Men like to sit with their legs apart, as a quick glance at a train—or indeed anywhere with seats—will attest. Sometimes, women don’t understand this behaviour; occasionally, they think that it is unreasonable and selfish. I visited Brussels for a spot of Christmas shopping this morning. 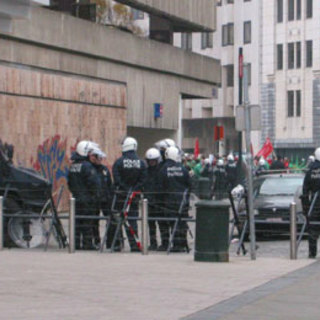 As I walked along Rue Neuve, I noticed that the side streets were barricaded with barbed wire and that the riot police were out in force.